As critics of the quality of governance democracy provides, sometimes it can be a bit lonely, intellectually speaking. Sure, there’s the work of Mancur Olson, but a dead economist can only provide so much company. Despite the huge relevance of diagnosing the defects of democracy to the current arc of history, in many ways it’s a dusty and neglected corner of economic theory. Which makes it so delightful to come across a book like Jonathan Rauch‘s Government’s End: Why Washington Stopped Working, which is essentially an application of Olsonian theories of special interest capture to 20th century America. Just to get a quick idea of how much overlap this book has with our interests, chapter 2 is called “Mr. Olson’s Planet”, and the previous edition of the book was titled Demosclerosis. Here I thought we were the only ones talking about democratic sclerosis, and someone else coined a clever word and titled a book after it! In 1958, around three-fourths of the people said they trusted the government in Washington to “do what’s right” always or most of the time. After the assassination of John F. Kennedy, a long decline of confidence began. By about 1980, the trust level had fallen by more than half, and, apart from a temporary excursion upward during the Reagan years, it has stayed in the 20 to 30 percent range (depending on which poll you look at) ever since. Americans’ mistrust of their government’s capacity to “do the right thing” ranks among the largest and most consequential political changes of the twentieth century. Other data tell the same story of disillusionment. Two-thirds of Americans, solid majorities of Democrats and Republicans alike, say that the government creates more problems than it solves, rather than vice versa. By more than two to one, people say the abuses by the federal government are a bigger problem than abuses by big business, and that “big government” is a greater threat to the country in the future than “big business” or “big labor”. Between the early 1950s and the early 1990s, the proportion of people saying that government wastes “a lot” of their tax money rose from fewer than half to 75 percent. The American Association of Retired Persons alone boasts well over 30 million members, or one of every six adult Americans; because most of us have aged relatives, most of us are among the group’s indirect clients; because we all grow old, each one of us is among the group’s potential members. If you add the farmers and veterans and oil workers…you see there is no longer anything particularly special about “special interests.” Today everyone is organized, and everyone is part of an interest group. We have met the special interests, and they are us. If, however, the interests are no longer special, they are not quite general, either. And here is a puzzle. Conventional wisdom has suggested that as more Americans got organized, and as the process was opened up to more groups and classes than ever before, the claims of all of those competing interests would be weighted and mediated in the political process, producing a more balanced and satisfactory result than the fat-cat system had ever done. But that is not what has happened. The public today is less happy than before, and problems seem less likely to be solved. It is possible to cook up all kinds of ad hoc explanations for what went wrong. Many have some truth in them. But most of them are ultimately unsatisfying. A standard complaint has been lack of leadership. But that diagnosis does not explain enough. There is little evidence that the people are electing poorer leaders now than in the past, that a worse class of person runs for public office, or that human leadership capacity has deteriorated over time. While this book rests on Olson, don’t think it is merely a summary or a rehashing. Rauch takes Olson’s theories and applies them at the level of a specific government during a specific period in history. And not just any government or period, but the one that is likely to be the most interesting and relevant to the most people: the recent history of the United States of America. 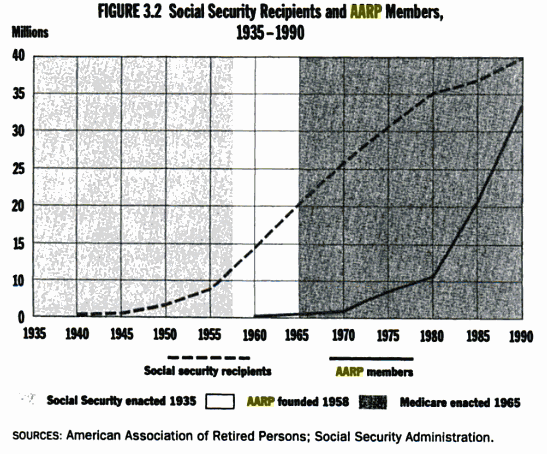 As recently as 1965…only one in thirty Social Security beneficiearies had actually joined. That was predictable; banding together takes time. But once the ball starts rolling, momentum builds…By the 1990s, when the number stabilized, AARP’s membership accounted for the vast majority of Social Security recipients. The organization’s headquarters in Washington had grown so large as to have a legislative and policy staff of 125 people, sixteen registered lobbyists, and even its own zip code. I am delighted to see further popularization, exploration, and extension of Mancur Olson’s work, because the logic of collective action is the story of modern politics and the explanation for the decay in governance quality. The more people who know that story, the more independent angles we’ll get on effective solutions, and the more momentum will get behind each one. I am very curious to see, as the book progresses, what Rauch has in mind for possible solutions. it is not too expensive nor will the surgeon take an excessive amount of time to complete the job. There is certainly a llot to know about this subject. I am a big fan of this book, and recommend it as THE introductory book to public choice theory to all of my left-liberal friends and audiences. It has been endorsed by a number of very high profile Democrats, including Bill Bradley, and feels entirely sensible and non-ideological (which, of course, is the way that common sense ought to feel). Anyone who reads this book ought to feel, well, pretty depressed at aspirations of significant change through the political process. And over here at Thousand Nations, oddly enough, we cheer those who finally become wise enough to feel pretty depressed at aspirations of significant change through the political process. I heartily second this endorsement (in case you couldn’t tell by my having linked this in my guest post, below). I wish Rauch would update the book with a chapter on Bootleggers and Baptists, the meltdown of 2008 and other such good stuff. If I could force Americans to read one book, it might very well be this one. Great post.